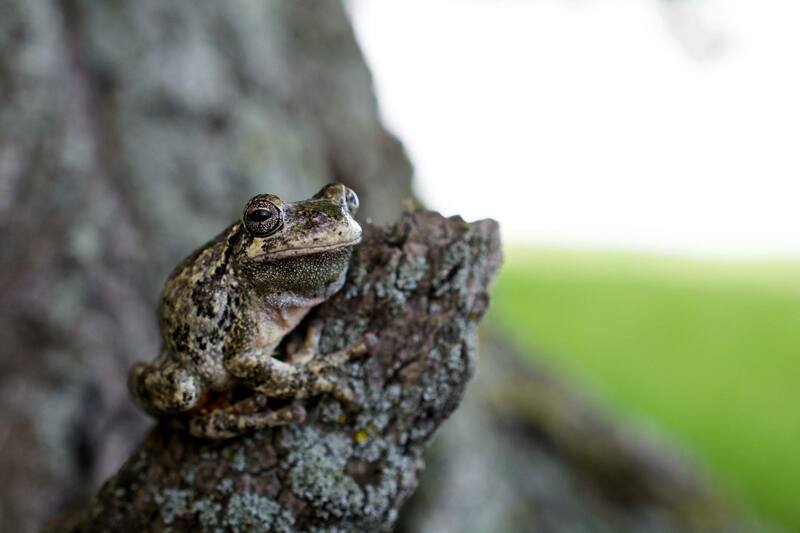 Fermilab has many acres of wetlands including; floodplain forests, vernal pools, lakes, marshes and wet prairie, making it an ideal home for reptiles and amphibians. Renewed interest in frogs, toads, salamanders, snakes, and turtles prompted extensive surveys throughout the site between 2013 and 2017. Information gathered by this type of sampling aids Fermilab staff in identifying occurrences and distributions of rare, threatened, or endangered species across the site. Pinpointing these populations helps mitigate environmental impacts when planning construction projects and day-to-day operations. Additionally, understanding how land management at Fermilab affects these species and their habitats can help steer methods to meet important conservation goals for Midwestern ecosystems. Two species of special interest are highlighted below. Blanding’s turtle (Emydoidea blandingii) is a medium-sized semiaquatic turtle distinguished by its bright yellow chin and throat and mottled shell. Historically common in northern Illinois, they are listed as state endangered and remain in only a few isolated, remnant wetlands. 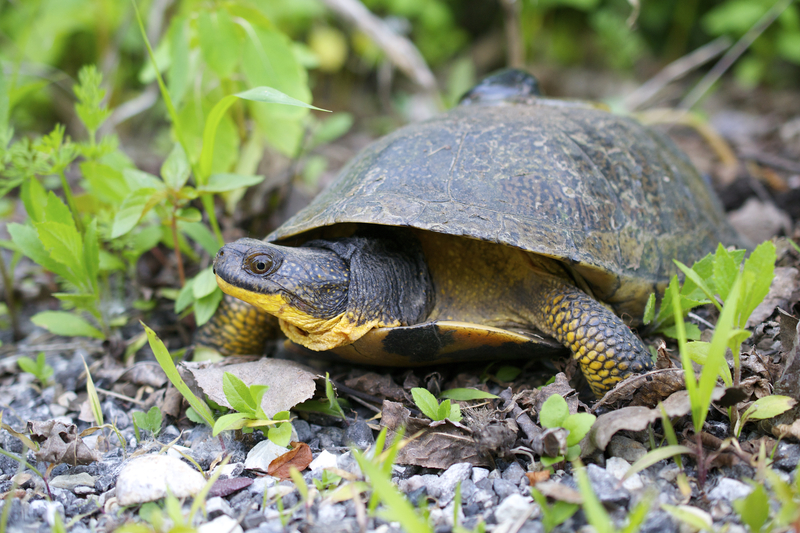 Blanding’s turtle is a Chicago Wilderness priority species. Blanding’s turtles are one of the most mobile of all North American turtles, making extensive overland movements between multiple wetlands throughout the course of a season to fulfill basic needs such as basking, feeding, aestivation, breeding, and overwintering. Because of their reliance on multiple wetlands that are often spread at some distance apart, their frequent movements between them, and their high degree of site fidelity, changes to the spatial distribution of wetlands and the surrounding upland habitat that provides safe travel corridors may threaten existing populations. 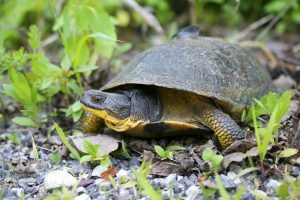 Blanding’s turtles have been found at Fermilab in remnant marshes in the past but have not been seen since 2000 despite several years of intensive surveys. Smooth green snakes (Opheodrys vernalis) prefer moist, grassy habitats such as sedge meadows and wet-mesic prairies. The diet of these small snakes consists mostly of insects, and they are particularly fond of grasshoppers and crickets. Because of their diet, insecticides are thought to be related to documented declines of this species in the Midwest. Categorized as an Illinois species in greatest need of conservation, these small, jewel-colored snakes have drastically dwindled in numbers over the past few decades. One female was recorded using cover object surveys in 2015. This was the first record at Fermilab in over 20 years. 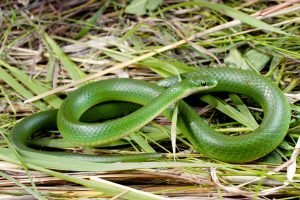 The smooth green snake is a Chicago Wilderness priority species and continued monitoring of the Fermilab population is needed to better understand its dynamics.